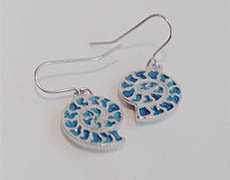 Ammonite shaped pewter earrings with blue enamel on surgical steel hooks. The Ammonite was named after the Egyptian god Ammon and belongs to an extinct group of Cephalopods who first appeared on earth 208 million years ago. Presented in a velvet lined gift box.